My first PC was an IBM XT 5160. I was a fault coordinator working for a company named SD-Scicon in the 80's (later bought by EDS in the 90's, who themselves were acquired by Hewlett Packard in 98) where my job was to direct computer engineers to relevant jobs up and down the UK. I had zero interest in this job and was often found lurking in the workshop looking over engineers shoulders. When the boss wasn't about I would be pulling computers, monitors, printers, keyboards and just about anything else in the workshop apart and then do my best to put whatever I had dissasembled back together again. The engineers were a top bunch and showed me how to solder and fix motherboards, AST six-pack boards, replace monitor flyback transformers, printer fuser units, make up networking cables etc. One engineer was a chap named Bruce who took me under his wing. I would stay late when he was on site and would sit and watch him work. I once witnessed him fix a PC with an intermittent reboot problem which had been in and out of the workshop for months. He sawed a ridged piece of metal and superglued it to the top of the units CPU. This was the first heat sync I had ever seen. He had guessed that the CPU was getting too hot and fitted this piece of metal to help disperse the heat. The PC was shipped back to its user and we never saw it again. The workshop had a BER (Beyond Economical Repair) bin. When kit was deemed too expensive to repair in terms of engineering man hours v replacing a component, items were tossed in the BER bin. In the evenings, Bruce had me rummaging through the bin, pulling parts and working to restore them. I wasn't getting paid overtime and the hardware had been written off and was destined for the skip so this was a great way for me to roll my sleeves up and learn. I loved it. 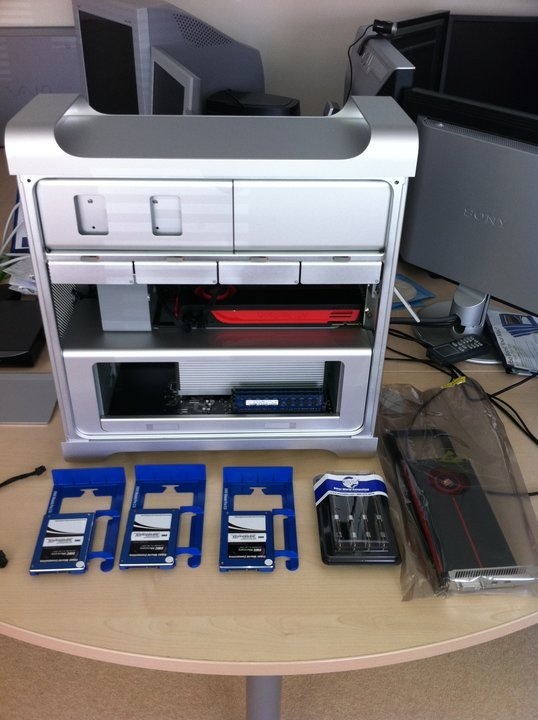 Over the space of a few months I managed to build a complete PC, all from parts originating from the BER bin. The PC I had resurrected from the dead was a fully functional IBM XT. Placing the PC on the Workshop replacement rack gave me a gratifying sense of achievement. I was completely taken aback when the next day my boss held a quick meeting, told everyone what I had achieved and presented me with the PC I had built! This was totally unexpected and was my prized possession for many years. Since then I have built many development rigs but none have come anywhere close in terms of performance and reliability to my MacPro. I was sick of seeing a spinning donut of boredom from Windows XP through to Windows 7. In 2010 I came close to buying a new car but considering I had gone a whole year on a single tank of petrol I thought a more useful investment would be a new development workstation. I had taken a closer interest in Apple since the launch of the iPhone in 2007 and although I was primarily a Windows developer I couldn't help but pay close attention to the Apple camp. After doing some research I made the decision to jump from a PC to a MacPro and Ive never looked back. In fact, I wish I had done it years before. 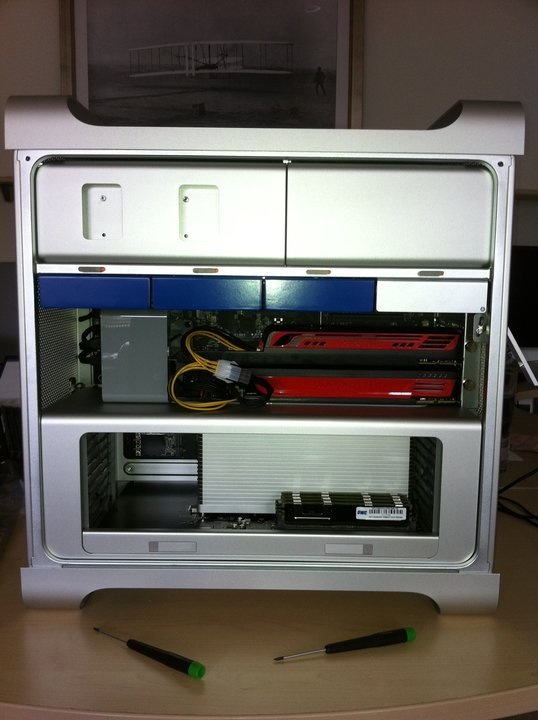 I received my MacPro on the 5th June 2010. I bought a mid-2010 MacPro with a single processor running 6 cores at 3.33 Ghz. I ordered 32 gig of RAM and 3 x 200gig SSD's from a company across the pond named "Other World Computing" www.macsales.com who after an extensive amount of research provided the fastest SSD drives available on the Planet at that time. I also purchased an ATI Radeon HD 5870 + ATI Radeon HD 5770 GPU's plus a 500gig Western Digital Caviar drive for the 4th bay. Once everything had pitched I set about upgrading the memory, installing the two Radeon GPU's and the three SSD's using an onboard RAID 0 configuration to eek out as much read speed as possible from the drives. 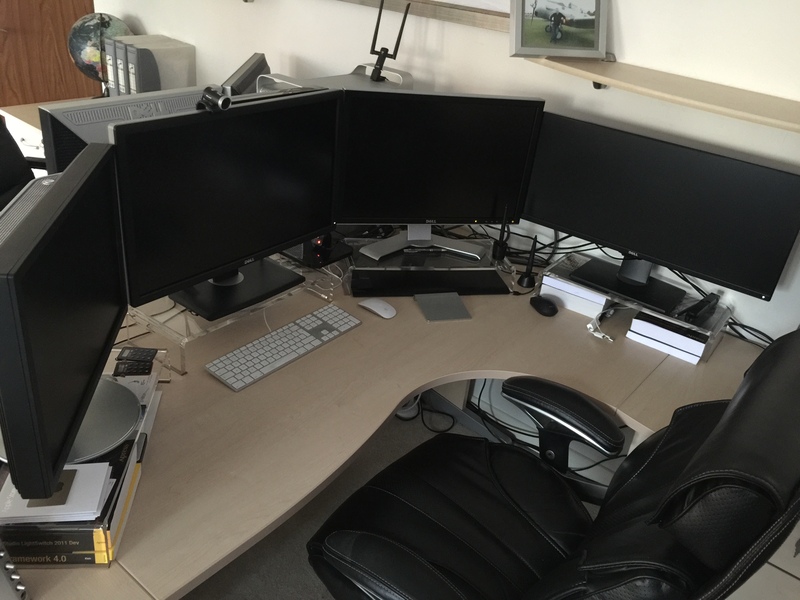 I fired it up, formatted the drives, installed the drivers for the Rads and plugged in three additional monitors giving me a quad screen set up providing acres of screen real-estate. I had been reading some good reports on Parallels which lets 3rd party operating systems run in a vm on a Mac. I downloaded from http://parallels.com/uk/ and installed. I then installed Windows 7 straight from an image available from the Parallels app and fired up the vm. Wow. I had thought that I would need a bare bones bootcamp install of Windows running on the Western Digital drive to get any decent performance from Windows but it was the fastest I had ever seen windows run and this was within a virtual machine! Granted the speedy RAID 0 SSD drives gave the vm a decent boost but I could hardly believe my eyes. As I rattled round the OS trying different things, copying large amounts of files all over the place in a blink of an eye it was a little disconcerting as things were so instant I had to look twice just to make sure what I had actioned had actually happened! My previous development rig had been a 64bit Dell Precision 670 configured with dual rotational Seagate HD's over RAID 0 and plenty of RAM. Looking back, it was a lame dog compared to my MacPro. Having a powerful workstation provided many benefits. Running Parallels I could easily install multiple Operating Systems and instantly switch between them with a simple flick of my Apple magic mouse. I often have OS X running on a couple of screens, Windows on another and Linux on the fourth. Within seconds I can expand any OS into full screen mode so a specific OS spans across all four screens. Every other development machine I had built ran hot. Fans were constantly whirling away as I worked. My MacPro runs cold and silent. Apple invest a huge amount of time and effort in designing their products. This was evident when I built my Mac as everything was a breeze and easily slotted into place, literally on rails. I did have to use a power splitter to feed the GPU's which meant a quick run in the car over to the local Maplins store but this was expected as I had done my homework. Having spent many years as a field PC / Server engineer it was a pleasant experience. Most PC's and servers are designed poorly and it can be difficult to reach places within the heart of the machine. Not with the MacPro. Its designed to be upgraded and expanded easily. I later decommissioned two of my office servers (a Primary Domain Controller and Microsoft Exchange email server) in part thanks to my new Mac. Having worked in many enterprise environments I like to receive my email instantly. Having to click or press "send / receive" is unappealing hence the two servers. Exchange 2007 needed a PDC to run so these units (which ran hot most of the time) were constantly eating electricity just to provide my office email service. This cost a small fortune to run and gulped as much time in maintenance as it did burning electricity. I had configured the PDC to run RAID 5 so it was a fairly safe place to store my code / files and I also used it for internal DNS routing so it did have a few purposes all be it expensive ones to run. Then I discovered "OS X Server". £14.99 from the Apple Store. I had it up, running and supplying instant emails to our iPhones plus routing our internal office DNS within an hour. A simple modification to the port forwards on the office router and everything sprang into life. I also use OS X server for Xcode continuos code integration for when we are in Apple development mode. All in all an absolute bargain for fifteen quid! All which was left was to find a safe place to store my code and files. After another round of research I decided to invest in a Network Attached Storage (NAS) device. I read many forums and reviews and decided to invest in a Synology DS1513+. This little, almost silent device supports hybrid RAID meaning you can stripe data across the disks providing full redundancy with the added bonus of later, when required, replacing a drive with a higher capacity than the drive being replaced and the unit will recognise and utilise the additional storage space and fold it into the array. For its price point I thought this feature was fantastic. I now had somewhere to store my files and code repos so could decommission the two office servers which originally provided our office email, DNS and file storage. For more details on this read my full post on configuring and running a Synology Git Server. I was so impressed with my MacPro that a couple of years ago I treated myself to a MacBook Pro Retina Display laptop. I also run Parallels on this and it's without doubt the best laptop I have ever owned. I use the track pad to seamlessly switch between Operating Systems, the display is crystal clear and it runs nice and cool. My fave feature has to be the fact you simply open the lid and everything is there as you left it. I had clunky Sony and Dell laptops before hand and was always having to wait for them to boot up and sort themselves out. They both frequently left me hanging watching a blue circle spin round and round. I never see this when running Windows on a Mac! 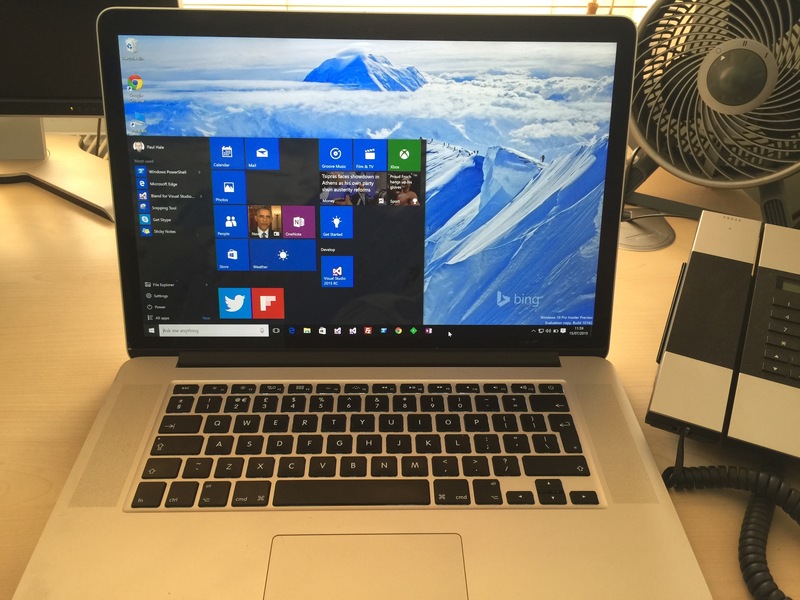 No, I'm a Windows developer... but Windows runs better on a Mac.